Oakdale Fencing Ltd supply a comprehensive range of timber fence posts , concrete fence posts , treated tanalised timbers, garden fence panels, garden trellis and wooden garden gates suitable for every garden fencing application imaginable. As one of the UK’s leading fencing suppliers, we consistently stock a range of chainlink, wire mesh and security fencing suitable for garden, commercial or agricultural fencing applications. If you are looking to re-model your garden you can be sure to find all the fencing supplies you need at ultra competitive prices. 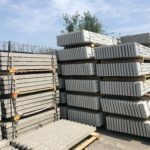 For industrial and commercial enterprises we can supply a full range of new and used armco barrier suitable for protecting walkways, loading bays, columns, pillars and walls in industrial and car-park settings. Check out our site to see the huge range of materials we offer, if you need help with measurements and dimensions or if you are just looking for a little expert advice please don’t hesitate to call us. Kenilworth, Solihull, Northampton and Kettering. We also deliver more widely, so if you live outside or near to our delivery areas please use our delivery postcode checker that is available on all the main pages or give us a call on 024 76 588 909 for a competitive quote.